I had to endure numerous arrests by the government, police and the KGB. An arrest could last two or three days, or weeks. But until they had enough evidence to convict, they could legally keep me only so long without a sentence of imprisonment. So each time I was arrested I was eventually sent home after the usual tactics were inflicted. Whenever I was beaten, I was told they would kill me if I told anyone. One time I came home from a police interrogation and my shoulders were twitching uncontrollably from the clubbing. My children asked what had happened to me. But how could I tell them? I suffered much from the spasms, which continued for several days. We prayed for God to stop them, which He did, showing us He not only had control of the arresting authorities but of my muscles as well. Aurica, two of the children, and I, took a summer vacation. During the three weeks we traveled in the countryside God told me trouble was coming, but I was to be strong and not fear any evil. He promised to put His words in my mouth, and the police wold not be able to harm me. Also on the trip, I had both a dream and a vision of a man with whom I had indirectly worked in supplying Bibles to Christians in communist lands. He was a few years younger than I, and he was very intelligent and capable. I eventually learned that he had give Bibles to some Russian relatives who were later arrested with the Bibles. The police raided his house, in turn, and they found an additional 3,000 Bibles in his garden. Having seen him in the vision and a dream, though not knowing any of these things, I was concerned and prayed for him. When we returned home my mother told us that the KGB had been coming every hour of the day and night looking for me She said the police had been searching the entire country for us. She had no sooner spoken than the police walked into the house and grabbed me. "Now you are in trouble!" they told me. "We have all the facts that we need to convict you." They dragged me in to the main police station, which was becoming a very familiar place. At last they thought they had a complete case, strong enough to convict me and bring my execution. My "crime" was, of course, Bible smuggling. But despite their ingeniously laid traps, all their plans went awry at the start. The huge number of people they call in as "witnesses" against me were told to testify that I had given them Bibles. "That's not true," they stoutly declared, despite the threats they had to endure. "This man did not give us any Bibles, we do not know him." In turn, when I was questioned with each person brought in, there was an unshakable firmness in my stand, imparted by the strengthening of the Holy Spirit. Their testimony, without exception, supported everything I said. If I had at any time spoken one word on my own, or changed my testimony, they would have caught it, with fatal consequences. Just the same, the police assumed I could not possibly escape this time. They ad a prime witness, my friend John, who had been arrested after the thousands of Bibles were unearthed in his garden, and who dazedly claimed, under torture, to be my accomplice in a Bible smuggling ring I supposedly headed. As the police began interrogating me, John's name began cropping up in the questions. Since God had warned me, I was now alerted to the possible motive behind the arrest. I gradually perceived from their conversation that he had broken down under the relentless interrogation and torture, and that he had "confessed" things I had done which, in fact, I had not done. They were so sure they had all the facts I was presented with the thick report. They even accused me of starting a conflict between Russian and Romania! "It is not true," I told them. "I have not done anything wrong. I am not a criminal or spy as you say." "Here is the evidence of your crimes," they shouted in my face, showing me the massive document. "We have everything necessary here to convict you. Do you want twenty-five years in prison or execution? It's your choice." "No, it is not my choice," I replied. "God is over you in this matter, and you cannot do anything on your own. You will do exactly what He tells you to do." This truth infuriated them, and they beat me all the more. Yet God showed He was with me by making my muscles strongers so I could endure the beatings, no matter how long and cruel. "We know everything about you," they blustered. I had to reply, "But if you know everything, why do you ask me so many questions?" God always gave me the right answers. They could never trip me up in my testimony, though I did not know at times what was coming out of my mouth, due to the lack of sleep. Finally they decided to confront me with their major "proof" against me, my friend John. His testimony (I learned later) had broken down at various points, because he could not remember what he had said the previous day. So he often contradicted himself. They were furious with him for changing his story. "Oh yes, I forgot I said that," he would tell them, but soon would change his story once again under extreme beatings, so that the police were made even more enraged. "We're going to leave you two alone here" they said to us. "You'll both have to discuss what you did in the past, such as how many thousands of Bibles you, Elijah, sent into Russia through John. Discuss everything about your criminal activities together, and when we come again you will have to tell us the truth." They believed that by putting us together, one would trip the other up, and thus they might get two "birds in one swoop. Now John had already "confessed" that I had supplied him with thousands of Bibles. The police simply wanted me to convict myself with some slight reaction or assent to John's charges. They reasoned hat I would be forced to say something sooner or later in response to him. John and I were put together in a room with two chairs and a small table. We had been told what chairs to take, on either side of the table. He was pale and shaking from the shattering experience of torture and the continual interrogation. I knew exactly what the police intended by bringing us together, but John could not help himself. I knew that he was going to say some unwise things, and that the police would be listening to every word through a tiny electronic "bug" planted on the underside of the table. Of course, John was reduced to a wretched pawn in the merciless hands of the police. Left alone, we simply looked at one another for a few, suspenseful moments. "Brother Elijah," John began. But I found myself springing to my feet and interrupting him. "What?" I cried, astonished by my own behavior. "You are my brother? You are sure you know me, and you are my brother?" John stared at me and then broke suddenly into laughter. He continued to laugh and could not stop. He was so convulsed with uncontrollable laughter he fell to the floor, holding his sides. A chief officer rushed into the room. "What's going on here?" he demanded to know. but John continued laughing. "I cannot stop!" gasped John. "No brake, no oil!" --a Romanian expression for his absolutely helpless fit. "I cannot stop!" he somehow managed to squeak between terrific peals of laughter. "No brake, no oil..."
I did not say one word to John that could have caused his attack. I simply asked him if he was my brother. But he could not stop laughing. His attacks were no mere chortles or chuckles. "Just look at the poor fellow!" I cried to the flustered officer. "Take him to the doctor at once and get help immediately!" John was seized and taken out, still laughing so madly he appeared to be dying of the effects. I did not see him again for hours, but when he was brought back into the room and his eyes fell on me, he exploded once again. Poor John! He was defenseless. Every single time they brought him again to talk with me, the same thing happened. Gales, hurricanes, tornadoes of hilarity swept dear John away. This went on every day for two weeks! Though I never so much as smiled at John, he was stricken with laughter at the very sight of me. Finally, they stopped bringing John, for the mere sight of the back of my head was enough to give him hysterics. "Take this man away, please!" I protested each time to the police. "Check him out! Get him some help from the doctor!" They had counted on this face-to-face confrontation to get us to divulge something incriminating, but such a method utterly failedto obtain the necessary evidence for my conviction. John was taken to the prison psychologist who declared he was incurably deranged. The rage and frustration of the police then became so great they would have killed us both on the spot if they had possessed only one atom of legal proof. Forced to let us go free, the police could only gnash their teeth as they thrust us out the prison doors. A couple of months later I happened to approach John on the street. He was about a block away when he saw me. That was all it took for him to began laughing uncontrollably as before. After his "medical discharge," he served the Lord without interference for a time, before he was again arrested for Bible smuggling. He was executed in 1983, thirteen years after our mutual incarceration in 1971. This brave man of God had enjoyed a productive extension of his life, and died a martyr. About a year after the arrest and laughing incident, in April of 1972 I set out to visit God's people across the Romanian-USSR border. I had good reason to go to Chernovitz, the former Romanian capital of the region taken over by the Russian army in World War II. I had many relatives and friends, fellow Christians, in beautiful, old "Cherno," as we called the beloved city. Only ordinary identification papers were required to cross the northern USSR-Romanian border because both sides were Romanian in population. I checked in at a hotel, and then left after telling the manager I was going to visit friends. Worshipping God in a meeting of an underground church, I was surprised when the KGB suddenly thrust themselves into the house. As the secret police tore the premises apart in search of Bibles, and searched men, women, and even children, we all continued to pray and seek God for His help. A box of Bibles stood in plain view by the entrance door. If they saw it, we would all be in big trouble, and no doubt I would be help responsible and executed. The raid was finally concluded. It took some time because there were over one hundred people present. Expert sleuths, the police somehow failed to see the large box by the door. They grabbed me anyway, knowing who I was, the suspect "Bible smuggler." I was taken to prison for interrogation, but they also grilled the manager of the hotel. He was no help to them. He had let me go without inquiring exactly where I was going. Unable to convict me on the basis of the hotel manager's testimony, I was, nevertheless, held three weeks and questioned intensely. Sleep-withholding tactics and beatings of course, accompanied this process. The Holy Spirit, as He had in the past, gave me every word. Not once did my testimony lapse in consistency as I maintained my innocence against their charges of wrong-doing. The same God who utterly blinded the KGB to the big box of Bibles now frustrated their very attempt to catch me saying something contradictory. The prime consideration of a jailed man is his date of release. 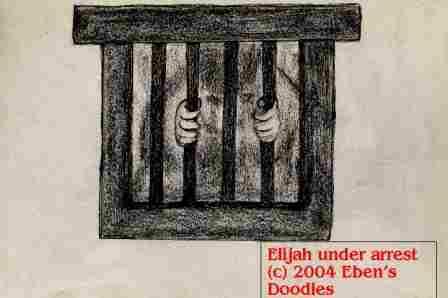 The first day they threw me in a cell I took the opportunity to pray and seek God to know the date of my release. God answered, giving me a specific date on which I was later, indeed, set free. God chose to deprive the police of any condemning confession forced from my own lips. Set free, I was sent back to Romania by train. I was re-arrested by Romanian police at the border. My countrymen knew all the details of the Soviet arrest but they tried their old tactics on me for several days. Also failing to convict me of their charges, they too had to set me free. I took the train home and walked to the little white house where no one knew that I had been released. They were still praying and seeking God for my life. The police told my wife that I had killed a man and that I would be in jail forever. The village did not believe it, though some thought I had perhaps accidentally run over someone with the car. Furthermore, Aurica was told that I had committed numerous crimes, a tactic used by police and KGB to smear reputations of Christians and wreck the faith of family members. I knocked for some time before anyone dared to answer the door. My wife and everyone praying with her could not contain their joy and astonishment. They had not expected to see me alive again. In yet another skirmish with the police, I was taken to prison for interrogation. It was the usual round-the-clock ordeal, with the "softening up" of beatings applied to render me pliable enough for making a self-incriminating, verbal blunder. I will never forget the time I was being dragged down a corridor by the guards when they suddenly halted in astonishment. An angel in a general's uniform stood blocking the way, his arm outstretched, pointing to me and ordering that I be released immediately! Without hesitation, the guards obeyed what they thought was a general to all appearances, and I was released!